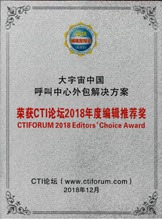 transcosmos inc. is delighted to announce that Shanghai transcosmos Marketing Services Co., Ltd., its wholly-owned subsidiary received the “Call Center Outsourcing Solutions Award” at the “CTI FORUM 2018 Editors’ Choice Award” which was held in parallel with the “2018 CTI Forum Industry Applications and Market Analysis Theme Salon” hosted by CTI Forum on December 20, 2018. 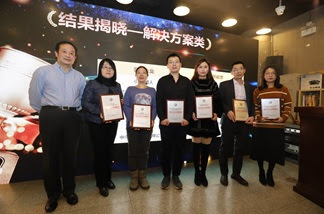 As one of the world’s leading outsourcing service providers, transcosmos China continues to deliver high-quality and highly productive business process outsourcing (BPO) services to clients. Since transcosmosChina launched its operations in Shanghai in 2006, the company has continued expanding its business, and now has multiple service bases in 7 cities in China, specifically, Shanghai, Beijing, Tianjin, Hefei, Changsha, Xi’an, and Wuhan, as well as branch offices in Shenzhen and Taipei. transcosmos China offers extensive services such as e-commerce one-stop services including contact centers, digital marketing services, system development services, and end-to-end DEC services for over 70 prominent Chinese and global brands. To date, transcosmos China has extensive experience and service record in providing services to the world’s top-class companies in diverse industries including the internet, 3C products (Computer, Communications, and Consumer Electronics), IT manufacturing, finance, baby care, apparel, cosmetics, retail, auto, telecommunications, and more. transcosmos currently supports 23 languages including Japanese, English, and Chinese. transcosmoscontinues to help clients expand sales, reduce costs, and strengthen competitiveness by offering high-quality and high-value BPO services.